When I was in Japan last week I was running on a tighter than expected schedule, so unfortunately I missed my chance to meet Mike in Tokyo (he's stationed near there) but on my way to the airport Friday I did have about an hour and a half to explore the city. Since this was just enough time for me to get disoriented (and potentially miss my flight) I opted for the true tourist's solution; a bus tour. It wasn't much but it was the only thing I could do for 90 minutes without having to put my luggage into storage and navigate through a strange city. 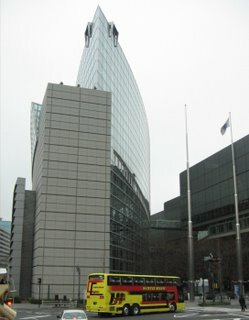 Although I'm usually not one for citiscapes, there were a few particularly impressive buildings along the bus route. Of course they were almost a bit daunting because you are quite closed in wherever you go. It seems the city has built up so quickly, or at least so thoroughly, that new construction projects are just squeezed anywhere there is air. 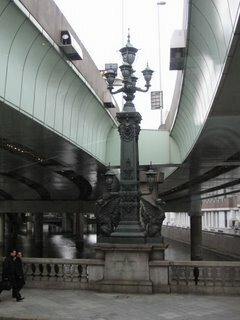 Things like this elevated highway, which is run over a canal, a large street, and a business district are so cramped that there's hardly any room for street lamps. There are apparently a few traces of old Tokyo, but you have to look hard for them. 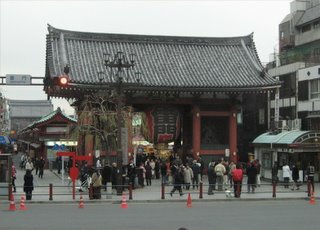 This is the Kaminarimon, or "Thunder Gate" to the Sensoji (Asakusa Temple) which was said to have been completed in 645. 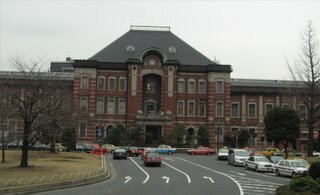 There is a very nice, large train station (with a hotel) in Tokyo, which I got to experience first hand because I had to ride one of the shinkansen trains to get to where I was doing business. 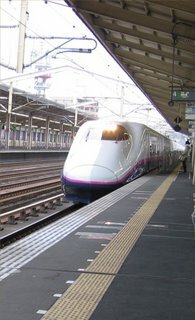 This was actually one of the slowest classes of shinkansen, yet traveled up to 150 mph. Even at relatively high speed is was incredibly smooth, in fact a couple of times I didn't even realize the train had started moving it was so gentle. That pic of Old Tokyo is awesome. I like reading about your crazy adventures... who knew engineering could be so exciting? Haha. Nice - any tips for your fellow business traveler? (though, I have to say, you do get a lot more travel in than I manage). It seems like you've gotten the "how to see a city in between flights" thing down to a science. I never expected engineering to take me so many places, that's for sure. Tips? Have a map of any major train and bus routes you may have to use; schedules are good too. Also, if you're arriving in a country in the afternoon or evening, it's best to have some currency changed ahead of time as the ATMs and money changers may be off/closed by the time you realize you need cash.